The path to where the informational log file is generated by this script. Add-Content -Path $LogFilePath -Value "$MyDateTime - $Message"
Write-Log -Message "The max password age for the $Domain domain is $MaxPasswordAge"
Write-Log -Message "Found '$($Users.Count)' total expirable AD user accounts"
Write-Log -Message "The user $($User.samAccountName)'s password will expire in $DaysUntilExpire days"
Write-Log -Message "'$($ExpiringUsers.Count)' accounts found with expiring passwords within $PasswordExpirationThreshold days"
Write-Log -Message "$($_.Exception.Message) - $($_.InvocationInfo.ScriptLineNumber)"
Automate script execution with Task Scheduler. 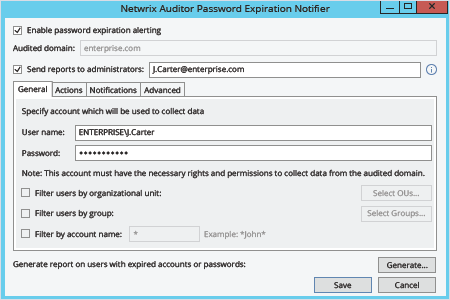 Run Netwrix Password Expiration Notifier → Select your domain → Click “Edit”→ Click “Enable password expiration alerting” → Click “Save”. 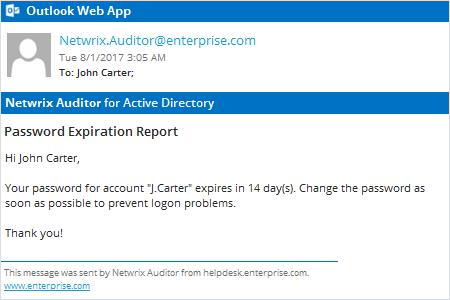 Netwrix Auditor will automatically send an Active Directory password expiration notification email to each account owner whose password is about to expire. Many best practices require regular password change to harden the security of corporate data and critical systems against insider and outsider threats. But if users ignore notifications to change their passwords, or don’t get them at all – for example, if they work remotely — they must wait for helpdesk admins to reset their expired passwords, hurting productivity all around. To minimize helpdesk workload while maintaining a strong password security policy, IT pros need a more efficient way of notifying their users about password expiration. 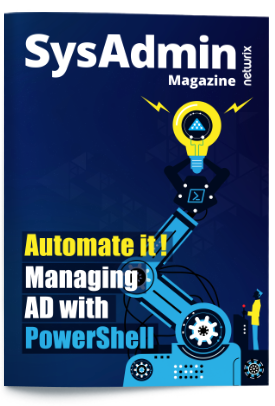 Netwrix Auditor for Active Directory enables IT pros to get complete visibility into what’s happening in Active Directory and Group Policy. It can also send notification emails that remind users to change their passwords before they expire; IT administrators can even customize the alerts to specify the exact number of days left before password expiration. In addition, IT admins get summary reports showing which user accounts’ passwords are about to expire. These alerts and reports enable IT pros to enhance security without sacrificing user or helpdesk productivity.